Today we have a guest post from Andy Martin, one of our dedicated Planet Four Talk moderators, who attended ZooCon13 in Oxford, UK this past weekend. In a previous life as a chartered chemist, Andy tested the air at the House of Commons, assessed the quality of food, water and nuclear fuel testing, and worked on standards for breathalysers and dairy farm milking parlours. He now runs a campsite in Cornwall where there are lots more stars to stargaze at in the night sky than there were inside the M25. And so to Oxford. Walking to the venue was a little like being outside Ikea on a Sunday afternoon. The streets were littered with parents come to transport their student offspring home for the summer, only to find they’d accumulated too much stuff to fit in the car – in one case three cars! I’m not sure that anyone counted heads but there were around 40 delegates present with large contingents from Planet Hunters and Old Weather (some of who brought cakes). It has been a while since I was audience side of the lectern and I quickly found that I now have an ocular choice, see the presentation screen or read what I’m writing. I chose the former and thus my limitations with the latter takes the blame for any errors, omissions or inaccuracies in what follows. The afternoon started with presentation by Aprajita Verma on the Space Warps project which looks for examples of gravitational lensing. In the simple version of this you have a star a long way off with another star in between. Instead of being obscured by the intervening star the light from the distant one gets bent around it to give two (or more) images around the middle star. In practice they are mainly looking at galaxies and the images are somewhat more complicated than the simple model would suggest. All very interesting, but why, you might ask and this is where all gets very technical. In essence these objects allow an estimate of the mass of the lensing object to be made – its a way of weighing galaxies. The project has been very successful, 2 million images in the first week, and has around 80000 participants around 40% of which remain active. As I said the things they are looking for are very rare but the image set contains a number of control images. When you get one of these and flag the feature, up pops a little “well done” window with some information about the type of lens you just found. Karen Masters from the University of Portsmouth gave the next presentation, highlighting some of the scientific highlights of the Galaxy Zoo project so far. Galaxy Zoo has been running since 2007, there are 200 thousand participants and to date some 40 million images have been classified. Participants are asked to locate galaxies in the images they are presented with and decide which characteristic group they belong to. 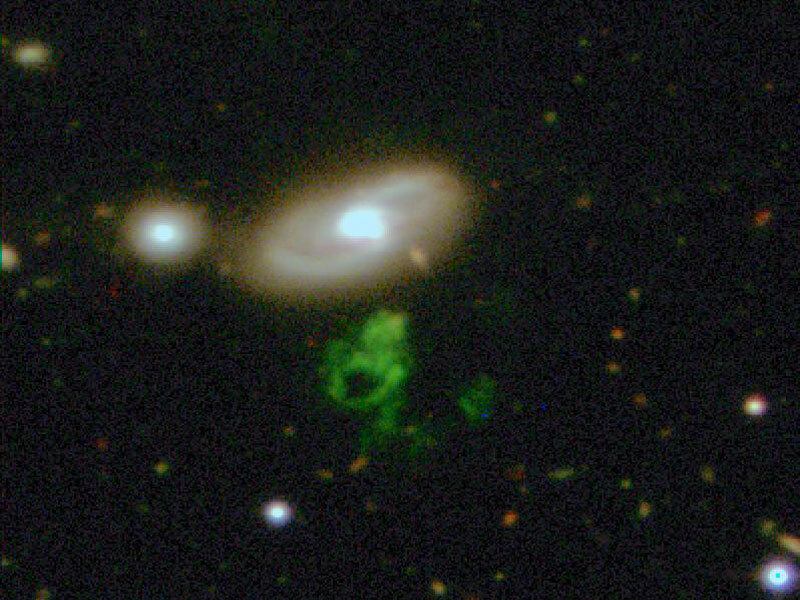 Galaxy Zoo has seen a number of published papers and scientific discoveries perhaps most celebrated being a strange object discovered amongst the images on Galaxy Zoo by a lady called Hanny who I had the pleasure of talking to later in the pub. Photos were duly taken of my amazement when she showed me her Voorwerp. The next presentation brought us back to Earth, Phil Brohan from the Met Office gave an insight into the Old Weather project. This involves the transcription of archived ships logs from a hundred or more years ago. The logs contain details of position, pressure, temperature, wind speed/direction, extent of sea ice and more, enabling a picture to be built up of weather systems in the past. Each log contains readings taken several times a day and the archive includes logs from more than a thousand ships. This picture of historic weather can be used to compare the weather today with the past and may help to answer the question “has the weather changed?”. As an example the recent ‘super storm’ Nemo which hit the North East USA had similar weather patterns to the great blizzard of 1880 which affected the same area. As well as the weather data the ships logs also contain information of the voyages of the vessels concerned and details of the people on them. The logs are transcribed from start to finish by the same person enabling them to follow the story of the ship and its crew. The current task is to transcribe records from the US archive which contains 75 million pages, and work is underway to include more archives in the future. Back then to the GalaxyZoo and Brook Simmons from Oxford University who gave a taste of what the future holds for the project. The next phase will look at images taken in the infrared which will enable images from further away, and thus older, to be looked at. Current images from the Hubble telescope are able to show objects back to around half the age of the universe, the new set of images will push that back to cover around 80% of the age of the universe. There are plans to provide online tools to make it easier to examine and work with the data and to enable more collaboration between individuals. Following a short tea/coffee/beer we regrouped to hear from Meg Schwamb via webcam from the USA. Meg gave an update on progress with Planet Four so far and gave a tantalising glimpse of some of the first results from the analysis of the data so far; Plotting of fan/blotch position onto the surface on a larger scale. Back to Earth again for the next item entitled “Only you can save planet Earth” and detailing the work of Solar Stormwatch. This project is concerned with looking at data from two cameras, one positioned slightly ahead of the earths orbit and one slightly behind which give a stereo image of the material ejected in solar mass ejections. The data from the cameras in can be combined to give an estimate of the direction and speed of the ejections and enable an early warning to be given of any activity which is headed our way. As you all probably know solar storms of this type can affect electronics, satellite communications and even the weather so any prior knowledge is of great use. The project looks at both historical data and live real time data. The historic data provides a much fuller data set than the live data but it is the patchy data in real time, which is being analysed round the clock by the people involved with the project, which can give an advanced warning of an incoming storm. Part of the presentation was a video from the cameras which shows the effect of a mass ejection on a comet, the tail is literally ripped away as the ejection front passes. Chris Lintott was next up to talk about Planet Hunters. My notes kinda dry up here so either I was swept away by his oration or I didn’t understand a word of it – all I managed to write down was that the first exoplanet was only discovered in 1995 and the rate and number of subsequent discoveries have led to a recent estimate that there may be as many as 17 billion earth sized planets in our galaxy. Lack of notes notwithstanding the success of the Planet Hunters project in identifying new candidates for exoplanets was clear from Chris’ presentation and particularly in finding things which have been overlooked by computers previously. Part of the current data are a set of images which are felt to contain the best bets for exoplanets – the message being if you want to find a planet now’s the time to go look. Many of the systems found to date are somewhat strange by comparison to our home system with many systems containing 2, 3 or 4 suns, and planets of similar sizes to those in our solar system have been identified including a many which fall into the category of “Earth like”, at least so far as size goes. The bad news is that the Kepler spacecraft which has provided much of the data for the project is now on its last legs. The good news is that another space mission is planned, there is still a huge amount of data from Kepler to be examined and other teams looking for exoplanets are keen to harness the power of the Zooniverse. To finish the day Rob Simpson gave us a snapshot of what the future holds for the Zooniverse. He started by comparing the billions of hours spent watching TV with the 100 million hours that Wikipedia has taken to put together. The TV box filled the screen, Wikipedia just a small box by the side. By comparison Zooniverse currently attracts 2 months of effort every day, small by comparison but how much better do you all feel for it? 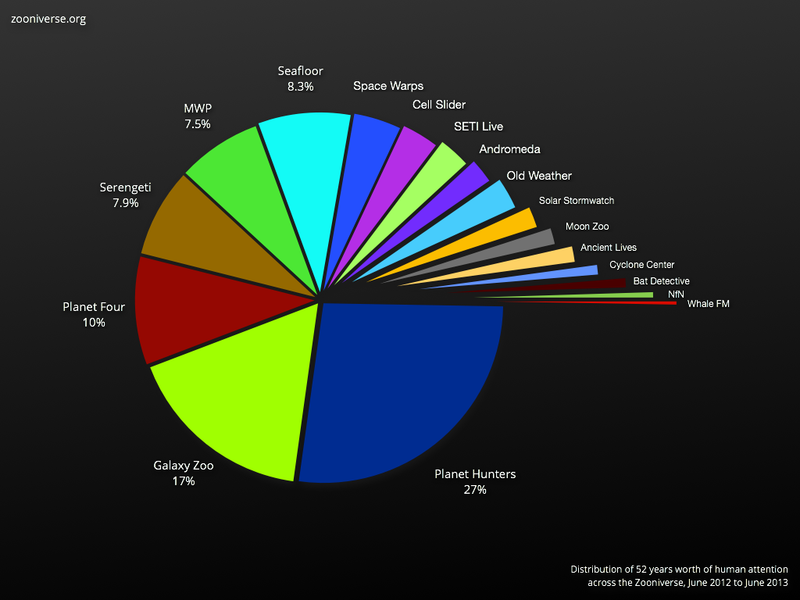 This image below shows the relative ‘size’ of the various Zooniverse projects over the past year. Rob has recently written a post for the Zooniverse blog about how the human effort for the last year is divided by project and how he calculated it. Rob mentioned Snapshot Serengeti which provides BushCam images for you to identify the animals in view and what they are up to. This project has been very popular and from the quick visit I’ve made since returning from Oxford I can see how it could be almost as addictive as marking fans on Planet Four. With the ‘formal’ part of ZooCon13 at an end we all retired to the nearest hostelry where, overlooked by a large oil painting of Patrick Moore, the workings of the universe were discussed long into the evening. My first ZooCon and hopefully not my last, everyone I met and talked to was friendly and keen to chat about all the workings of Zooniverse. Many have been coming to ZooCon for several years and it’s clear that many firm friendships have resulted. It was a pleasure to meet all of you and my thanks for the warm welcome to the fold you all gave me.